For the fourth consecutive year with funding from the U.S. Consulate in Jerusalem and in partnership with UNRWA, AMIDEAST conducted “Camp Discovery” — a multi-faceted, learner-centered summer camp experience for Palestinian youth aged 8–14 in refugee camps in Gaza and the West Bank. Students were nominated by UNRWA and selected by AMIDEAST based on academic performance and socioeconomic background. Those selected were enrolled in an interactive, 13-day program focusing on English language learning, artistic self-expression, and scientific discovery. 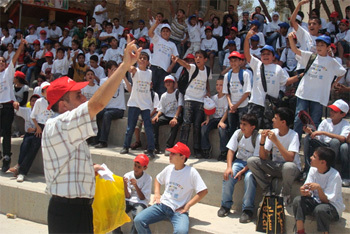 Camp Discovery 2010 benefited 540 students at six sites throughout the West Bank and Gaza. Since its inception in 2006, more than 1,600 students throughout the West Bank and Gaza have participated in Camp Discovery. The goal of Camp Discovery 2010 is to expand the students’ worldview beyond their home communities. Camp Discovery 2010 further endeavors to help students understand that education is an opportunity rather than an obligation. 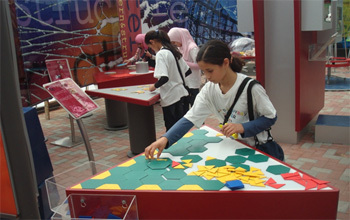 At Camp Discovery 2010, familiar academic subjects such as Science, Art and English were presented in the context of “experiential learning” along with new subjects including drama and educational field trips that took students outside the camp to locations such as Al-Quds University’s Math and Science Museums. Camp Discovery 2010 would not be possible without the financial support of the U.S. Consulate General in Jerusalem, which has supported this innovative summer camp program since its inception four years ago. The Consulate General’s qualitative input is also essential to Camp Discovery 2010. The tireless support and feedback of Cultural Affairs Officer Ms. Cynthia Harvey and her team is particularly appreciated by the Camp Discovery 2010 team. UNRWA donated the use of its school facilities to host Camp Discovery 2010, as it has done in previous years. This includes the use of classrooms, computer and science labs, and athletic facilities. In addition, UNRWA representatives assist AMIDEAST in selecting the students for enrollment in Camp Discovery. Youth alumni of the Partnerships for Learning Youth Exchange and Study (YES) Program and English Access Microscholarship Program (Access) — both funded by the U.S. Department of State and administered by AMIDEAST — serve in a variety of volunteer roles. YES and Access alumni are good role models for Camp Discovery 2010 students, sharing their English language skills and their firsthand experiences and perspectives on American culture and society. This year, for the first time, AMIDEAST tapped its Education Abroad programs to recruit American college students to assist as volunteers during Camp Discovery. These volunteers supported Camp Discovery 2010 in administrative and pedagogical roles. Their interactions with students provided positive firsthand experiences with Westerners essential to breaking down stereotypes and promoting greater cross-cultural understanding. The final exhibitions are the culminating days of Camp Discovery 2010, where teachers, administrators and members of the local community gather to celebrate the students’ accomplishments. Representatives of the U.S. Consulate General in Jerusalem, UNRWA, and AMIDEAST participate in the exhibition day at each site to witness the students demonstrate their improved English language skills through drama skits, songs, speeches, and through presentations of their art projects and scientific experiments and research.